Well, my coursework is all due in about ten days, which means it’s high season for procrastination! One of my chrissy pressies to myself was a copy of Boutique Knits, as I was completely besotted by the cloche hat on the cover. It has a real vintage style which I love. I was a bit doubtful if the hat would work for me though, but I was determined to make it anyway. 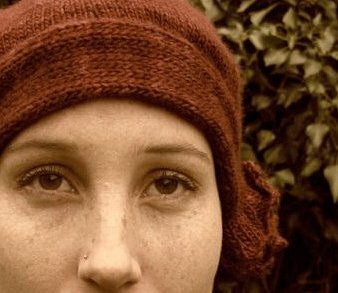 Such a gorgeous pattern called for gorgeous yarn – Sundara Aran Silky Merino (Ravelry link). I’ve been receiving Sundara Seasons Club packages every 2 months, so it’s definitely time that I start knitting with some of it. I finished knitting yesterday, I braved the cold outside for some quick self-portraits. As much as I love the hat, I was right with my prediction that it wouldn’t suit me. I just don’t have a big enough head (or enough hair!) to make it work. It just needs a bit more oomph. Thankfully it looks amazing on my flatmate, so it has quickly found an appreciative home. Given the seriously cold weather we’re having in London this week, the timing is perfect. And I’ll still get to admire my handiwork whenever she wears it.